Write what you know? Or lie, lie, lie. Manhattan-based writer Kristopher Jansma dives into the murky waters of metafiction in his debut novel about a talented but callow aesthete writing his debut novel, who might also be a pathological liar. 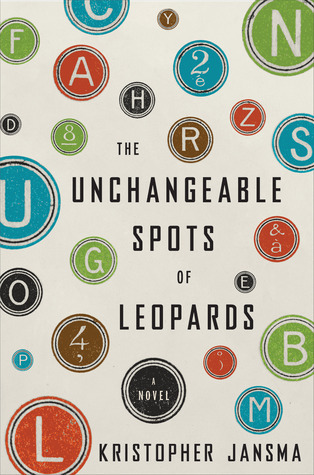 In The Unchangeable Spots of Leopards his unnamed and unabashedly unreliable narrator baldly bluffs his way around the globe, from Dubai to Iceland to Sri Lanka to Luxembourg. He tries on new identities at every stop as he writes and rewrites stories about his tortured relationship with his best friend and rival, Julian, and the charismatic Evelyn, who is never fully his to love. While not concocting stories that play with truth, fiction, and the difference between the two, the New Jersey transplant teaches creative writing at Manhattanville College and SUNY Purchase. 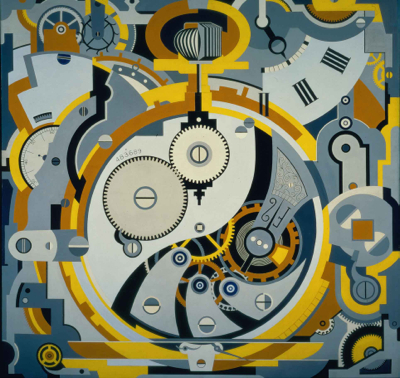 Jansma shares some of the great works of art that inspired his neurotic narrator's path. 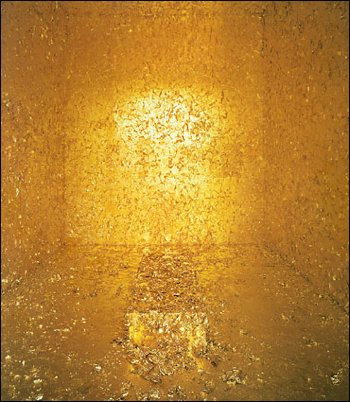 "The Death of James Lee Byars"—I saw this at the Guggenheim as part of their Third Mind exhibit in 2009, which was all about finding a bridge between Eastern and Western art. I think this was when I first began to think about writing Leopards. Goodreads: What's the best lie you've ever gotten away with? 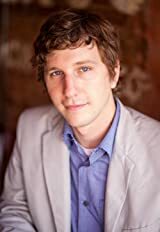 Kristopher Jansma: Part of the reason I loved writing the narrator in The Unchangeable Spots of Leopards is that he's such a better liar than I ever have been. In real life I'm a terrible liar. I actually do that thing where I'll stare down at the floor or off to the side...it's awful! The closest I ever got to getting away with a lie was in my sophomore year of high school. I was supposed to go to a friend's party, but my mother wouldn't let me go until I finished reading A Separate Peace for school. I'd forgotten, and there was no way I'd finish it before the party started. So I looked up a few details online (this was in the days before SparkNotes or Wikipedia) and swore to her I'd read it. I managed to answer every question she asked me about the book, but she just knew I was lying, so I wasn't allowed to go out. I think I only finally confessed that I really hadn't read the book to her a year or two ago, but of course she wasn't at all surprised. I did finally read the book, but not until college, and only then did I realize I would have had more fun staying home and reading it than I would have going to the party. 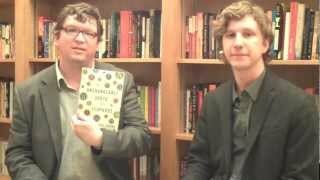 GR: Do you have a favorite unreliable narrator in literature? KJ: There are just so many great ones to choose from. Once I put together a whole syllabus of books with unreliable narrators...I'd love to teach that class someday. Tom Ripley and Holden Caulfield, of course, are both incredible. But my all-time favorite has to be the narrator of Henry James's novella The Aspern Papers. He's just so delightfully slippery. He's unnamed, of course, just like the narrator in Leopards, and at one point in the story he tells us that he confesses his real name to a woman he's trying to seduce, but he still won't tell us what it is! He never even tells us the fake name he's been using before then! Every time I get to that point, I drop the book, outraged at the injustice of it. When a writer can get you to feel totally betrayed by someone you knew was an inveterate liar and con artist? That's impressive. 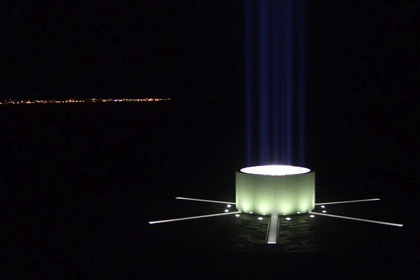 The Imagine Peace Tower made by Yoko Ono for John Lennon is featured in Chapter 9, set in Iceland. GR: During his college years, your narrator struggles with the meaning of Emily Dickinson's words, "Tell all the Truth but tell it slant—." What does it mean to you? KJ: My freshman-year fiction and poetry course was split into two halves. The fall semester was called "Telling it Straight" and the spring was "Telling it Slant". And so right off the bat, in the course catalog, that seemed like an incredibly important key...but of course I had no idea what it meant. By my second year I wasn't sure I understood it any better. It wasn't about fiction versus nonfiction or even truth versus lies, exactly, because they are two paths to the truth. One can drive directly ahead with unblinking, honest prose or one can take the reader on a joyride, gradually sidling up to the truth. Both ways will get you there, but the last two lines of Dickinson's poem suggest the second way is better: "The Truth must dazzle gradually / Or every man be blind—." GR: Much of the book's conflict stems from the narrator's intensely competitive relationship with his best friend and fellow writer, Julian. Are writers competitive creatures by nature—making a solitary act social? KJ: Yes, I think we are competitive, even if only secretly at first. Years before I had much reason to believe I had what it took to write a novel, I can remember flipping through books, thinking, "I bet I could do better than that." I'd have never said that out loud, much less to others, but then I went to college and met writers who were making that same bet. Of course sometimes we can get too competitive, the way Julian and the narrator get. I remind my workshop students now that this isn't a zero-sum game. It's not Survivor, where the way to be the best writer is to be the last one standing at the end of the semester. If they can find a classmate whose opinion they trust and whose work they love, then they've gotten something very valuable. There are more than a few such people acknowledged in the back of Leopards and for very good reason. GR: What's next for you as a writer? KJ: At the moment I'm elbows deep in my next novel, which I can't say much about yet. But I'll admit, since on Goodreads we're among so many other writers, that I'm betting it'll be even better. Thanks for the great profile. He seems like a nice humble and, strangely, honest fellow. I love the Emily Dickinson quote and ruminations. I would like to posit a third option to the question "Are writers competitive creatures by nature—making a solitary act social?" I believe writers are solitary collaborators shaping the psyche of their readers. When we dialog with each other, we start to form a stronger concept of the effect of our work in context of each other. Throughout the history of literature groups (like the Beat Poets & Writers, the Muckrakers and Protest Novelists) have emerged who certainly had conscious influences on each other and the society who read their work. As I write, I am always conscious of my fellow writers, seeking to reinforce our strong qualities, articulate our role in our society, and also look for ways to serve the needs of our readers. Today, I hear a real cry from readers for conscious writing that tackles some of the serious issues that we face as a nation and global society. I also hear that people are afraid, and sometimes seek literature as a balm to that fear. Many writers are starting to address this, finding ways of informing and uplifting the readers, bringing them into an empowered position in this time of intense social change. I am thrilled to work in collaboration with these people, even if, as you say, it is a solitary/social dynamic! Thank you for such a thought-provoking interview. I appreciate it very much! Todd one for book club?